This was what came out of Manny Pacquiao upon setting foot Monday at the Grapevine Domestic Airport in Dallas Metropolis, venue of his World Boxing Council super-welterweight championship collision with Mexican Antonio Margarito this coming Saturday (Sunday in Manila) at the Cowboys Stadium. The seven-division world champion’s statement, of course, came as mere affirmation of his statement made as early as last week proclaiming his readiness to bang with the three-time world titlist in his quest to become the first man to win an eighth crown in as many weight class. “Reding-ready na. Sabi ko naman kahit na anong araw gawin ang laban mula noong nakarfang lingo, fight na tayo (I’m, indeed ready. As I told you the fight can be held anytime as early as last week),” the 31 year-old WBO welterweight champ told this writer while on flight on board “Pacquiao Air,” a chartered American Airline jet liner. Before enplaning, Pacquiao capped his three-week training schedule in Southern California by running for 30 minutes around the ascending Griffith Hills before sparing for four rounds at the Wild Card Gym. Like in the past several days, Pacquiao appeared relaxed and happy as evident in the way he acts in the entire flight from the Atlantic Aviation compound ran by Starflite inside the Los Angeles Airport, service provider of the LA teams Lakers and Clippers and Boston Celtics in the NBA. He roamed around the 737 plane during the entire flight, greeting the 188 passengers, all of whom are his followers, including several Manila-based print and television media men. Contrary to early reports, there was a nary member of congress was in the flight, although a few Games and Amusements Board officials were on board. While on flight, the Pacman was honoured by Goldilocks which gave away samples of new products Ubi and Mango Fruit cake to the passengers. The entourage arrived past 9 p.m. From the airport the entourage, made up of two SUVs, the first carrying Pacquiao, wife Jinkee, mother Dionisia, who arrived Saturday, and other members of his immediate family, proceeded to the Gaylord Hotel, home of the Pacquiao-Margarito fight teams. According to Pacquiao publicist Winchell Campos, no activity was scheduled the whole night, except for the recitation of the Rosary at the hotel. 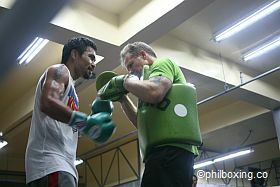 Pacquiao resumes the remaining five days of his preparations Tuesday, which according to chief trainer Freddie Roach will be confined to maintaining his fighting form acquired the last three weeks at Wild Card. “Everything is in place before we fly here. So we expect nothing of major consequence to happen in this final week of preparations,” Roach said. “Except, of course that for the purpose of maintaining his present condition, which are light exercises and several rounds more of sparring and roadwork,” Roach explained.